Empty calories are those foods we consume that provide very little nutritional value but are high in calories. Empty calories come mainly from two different groups: solid fats and added sugars. Fats that are solid at room temperature include chicken, beef and pork fat, and milk fat and mainly come from animal foods. Remember, beef/pork/chicken also contain protein and vitamins that are good for your body. However, solid fats can also be found in processed food that have very little nutritional value. Added to almost all processed food to make it sweet, the most common added sugars are sucrose and high-fructose corn syrup. Added sugars contain few if any vitamins, minerals or fiber but need these important nutrients to be broken down. They are not just empty calories but nutrient thieves too! This doesn’t apply to all donuts, ice creams, cookies or cakes. If you don’t want to completely avoid them, there are alternatives and in the next section I’ll provide you with an alternative to hotdogs. There are low-sugar and low-fat versions of many of these products. Make sure you read the nutrition facts to be sure of the sugar and fat levels. For this example we’ll use a typical hot dog sausage in a hot dog bread. 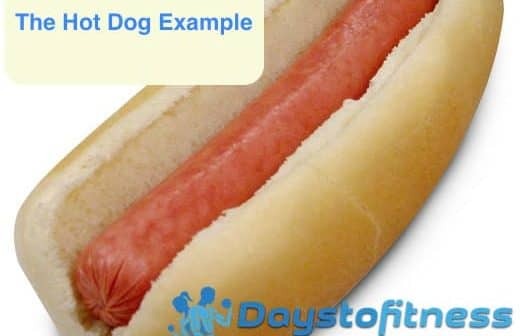 Here is a typical nutrition fact of a hot dog sausage. 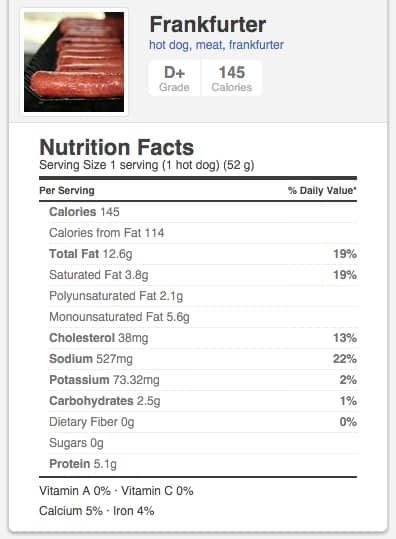 One hot dog sausage contains 145 calories and 12.6 grams of total fat which corresponds to 19% of what should be your daily value. It also contains high levels of Sodium (22% of recommended daily value) which can increase water retention. 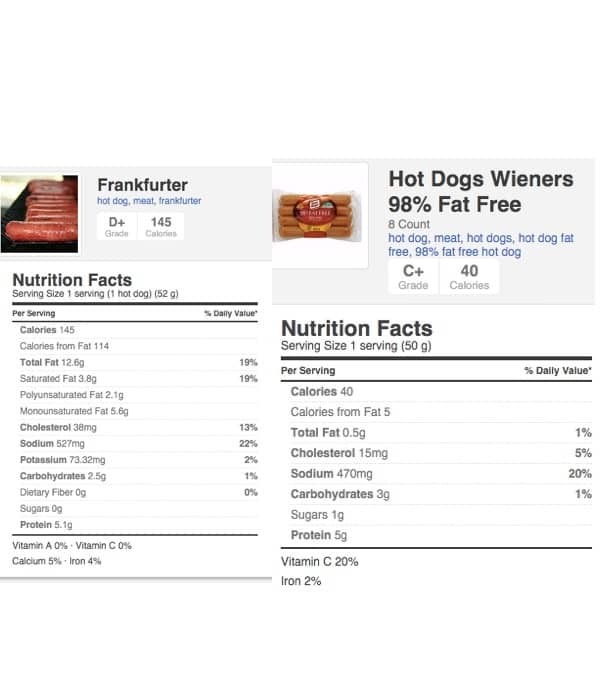 There are also5.1 grams of protein in one hot dog sausage. One 54 gram bread bun contains 3.5 grams of fat, high levels of sodium and 9% of the recommended daily value of Carbohydrate (4 grams of sugar). It also contains 4 grams of protein. Remember, we are not including any sauce or extra ingredients that are included in most of the typical hot dogs sold in restaurants. As you can see this is a good example of Empty Calories. 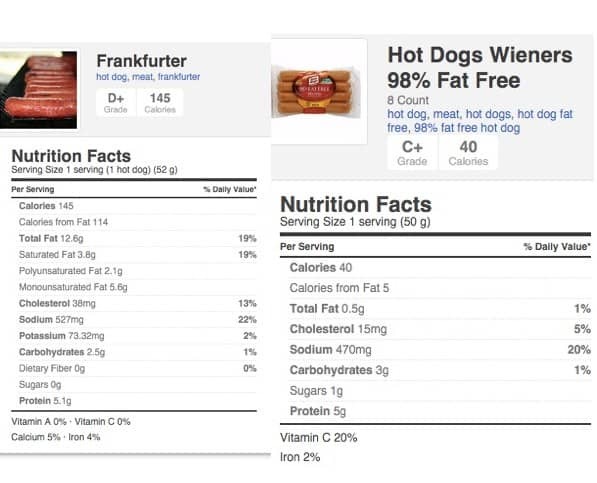 A hotdog, comprising only one sausage and one bread bun, contains 16.1 grams of fat, high levels of sodium and 4 grams of sugar but no vitamins or fiber. Let’s also not forget that this can’t be considered a full meal; you’ll probably be hungry again after a couple of hours. For a snack, it contains too many calories and too much fat to be considered healthy. 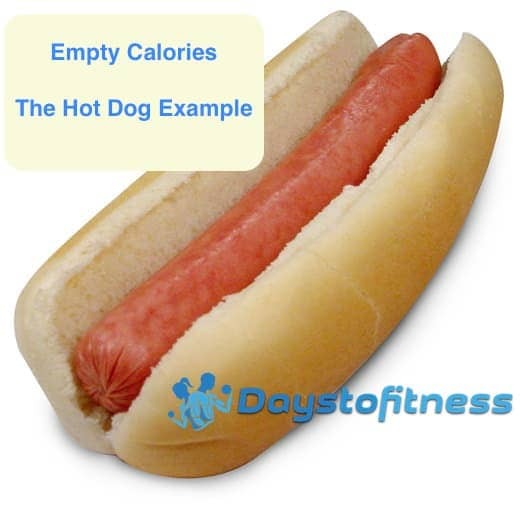 If you don’t want to avoid hot dogs you can search for low-fat options to reduce your fat and carbohydrate intake which will reduce calories and the chances of having too many calories that will lead to weight gain or, at least, prevent weight loss. 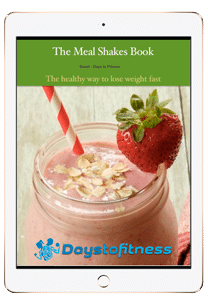 If are committed to losing weight (“How to lose weight with Meal replacement Shakes”), avoiding empty calorie foods, especially the ones which include solid fats and added sugars, will make a major difference to your daily calorie intake levels. If you don’t want to stop eating cookies, donuts, ice creams, or hot dogs, find low-fat and low sugar substitutes to reduce the number of calories you eat. Today, you can always find low-fat and low-sugar versions of most of processed food.